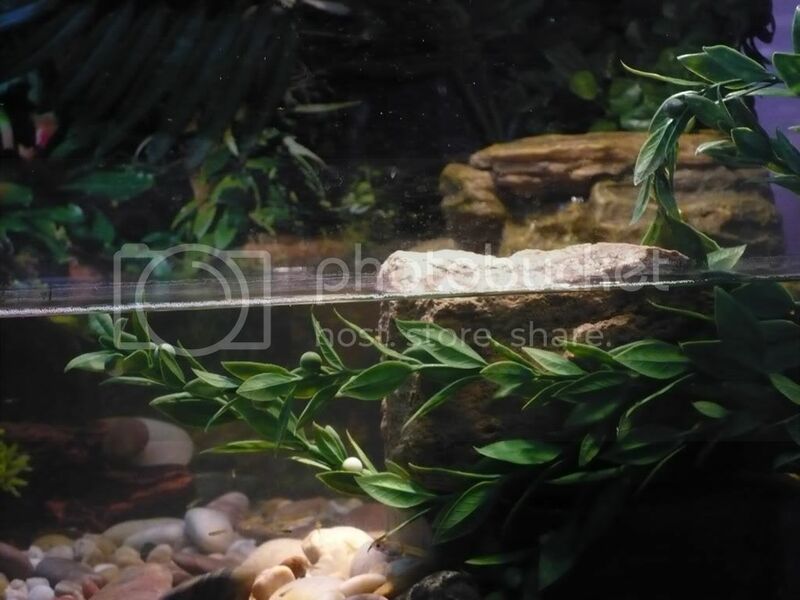 Redearslider.com :: View topic - POST YOUR BASKING AREA PICTURES HERE !!!!!!!!!!!!!!! 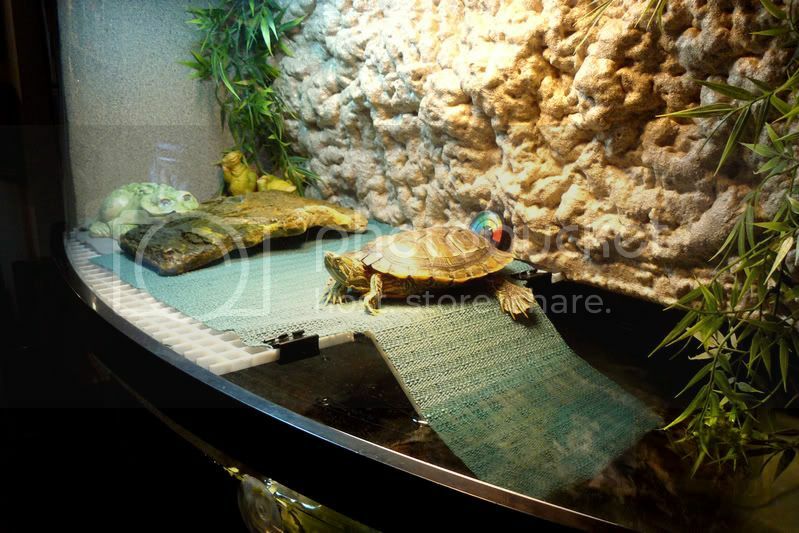 Habitat - Indoor :: POST YOUR BASKING AREA PICTURES HERE !!!!!!!!!!!!!!! Posted: Sat Apr 12, 2008 8:03 pm POST YOUR BASKING AREA PICTURES HERE !!!!!!!!!!!!!!! 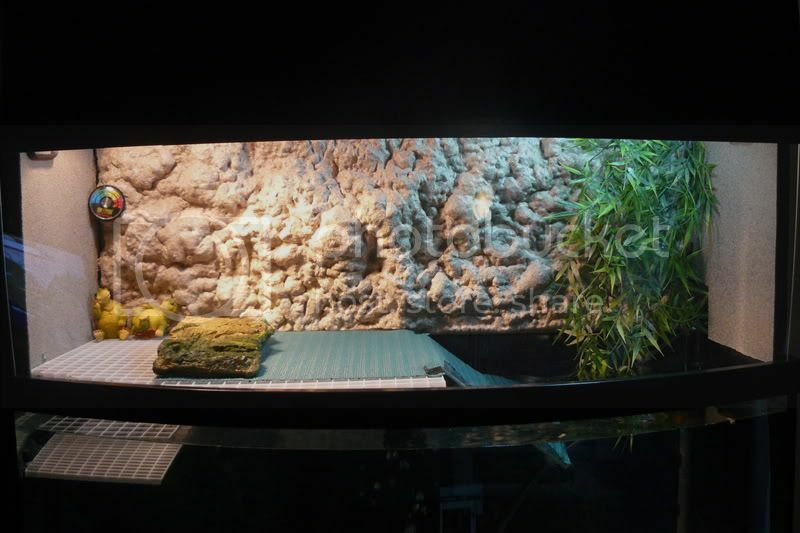 well, lately iv'e decided to make my own basking area for my three turtle which is only about 2-3in big but i have no clue how to make one so i wanted some suggestions and ideas from other people! Ralph's is a bit different. I think I'm going to make him one more like Frankie's soon. ­Ralpheal, "The 'L' is silent." This is mine. 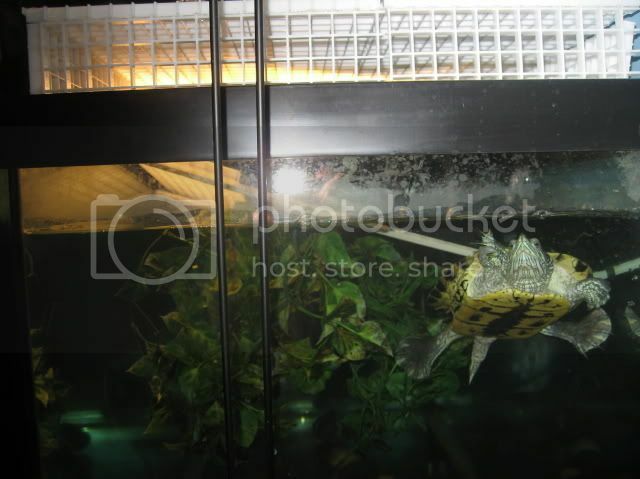 The basking spot itself is a piece of ceramic tile cut to size to rest on the rim of the tank, and his floating dock acts as a ramp for him to climb up on. 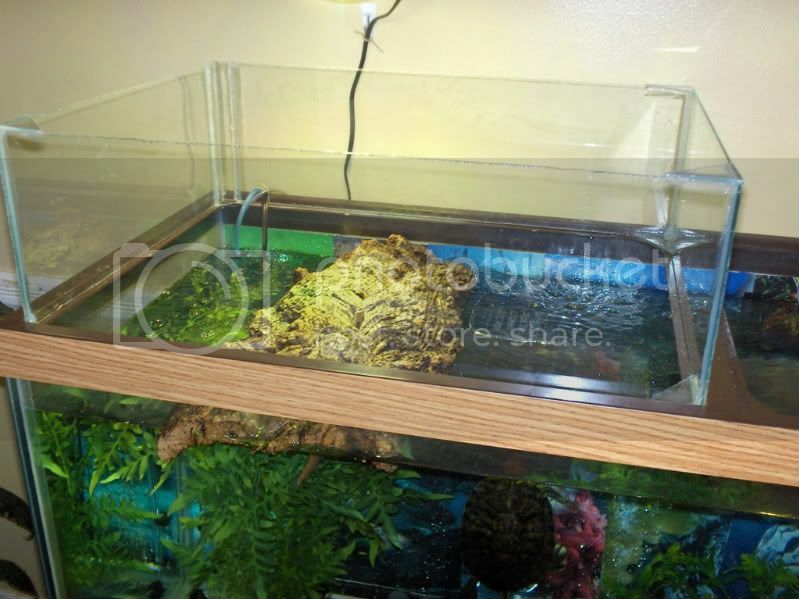 The rest is just a box that fits down around the outside of the tank with stops at the corners to hold it in place. 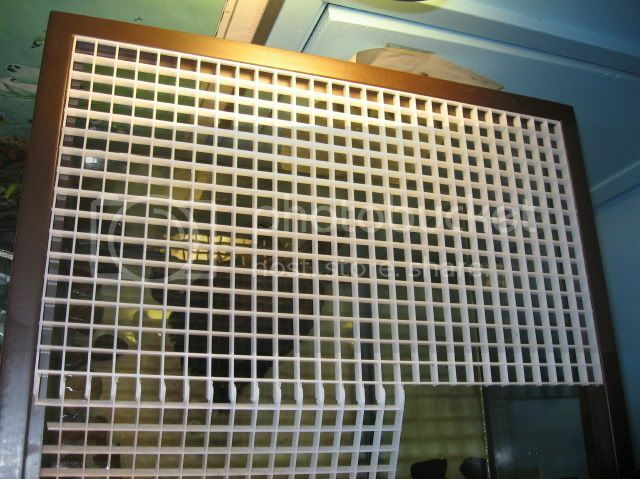 I'm not sure how the plexiglass is done in the front, my dad got creative with that part, and it looks like he somehow built that part around the plexi. 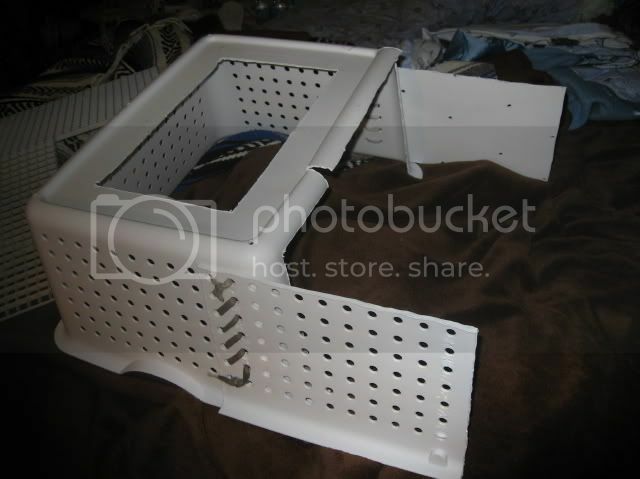 I'm sure you could just glue or screw a piece of plexi in place. 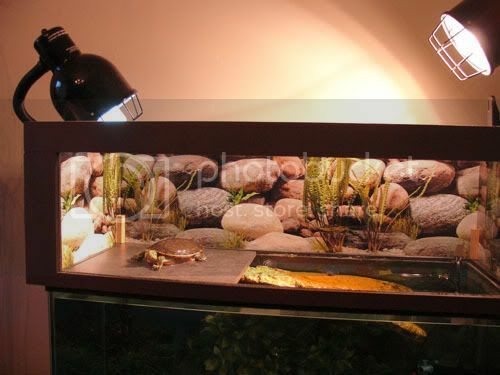 This is the Basking Area I built for Hurley. 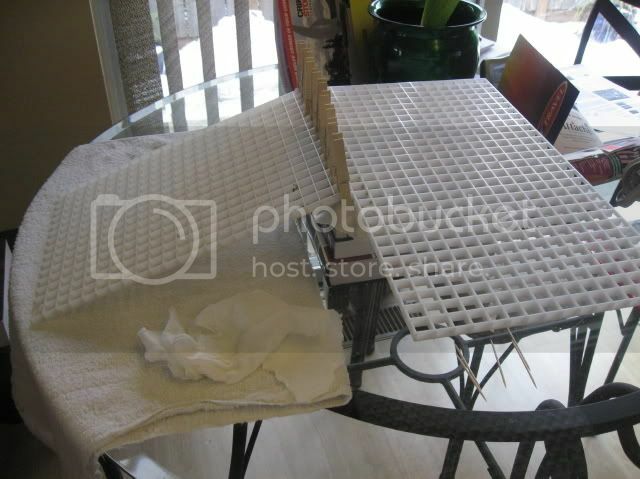 The ramp and deck are made of egg crate, I fused them together using a soldering iron. 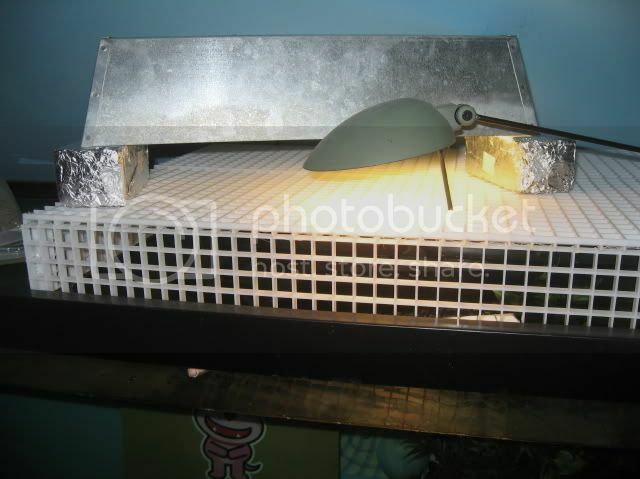 It no longer has the green slip guard and the statues, and I consolidated the lights with a Mercury Vapor Bulb. Curtis' basking area. I found this rock along the river and thankfully it's got a natural slope to make getting on it easier. 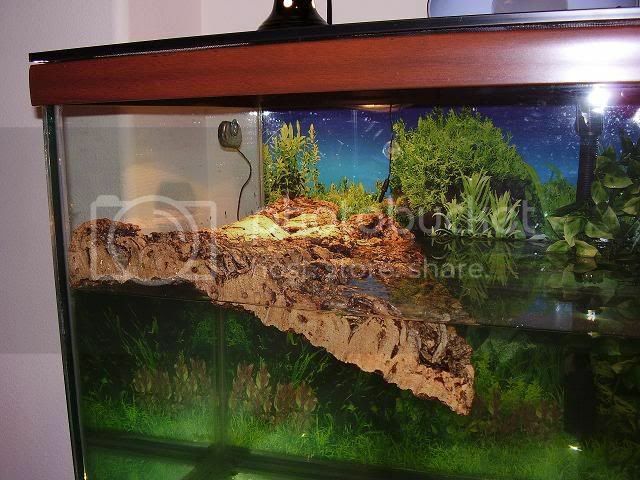 I love seeing how creative everybody gets with their tank ideas! Here's mine i did recently (i'm still excited about it! 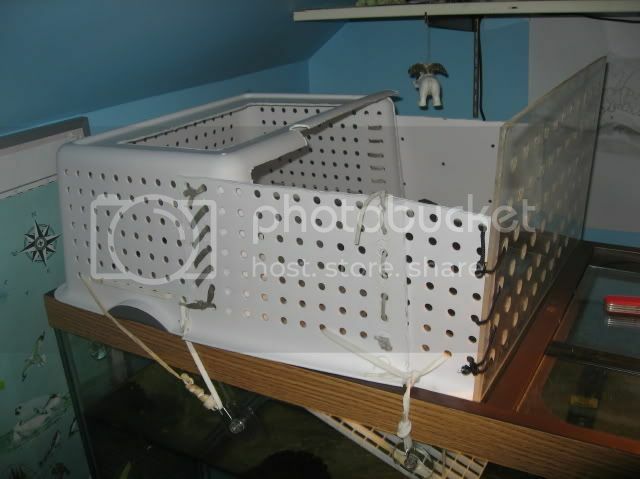 ), it's got the benefits of an above tank basking area (i.e. i can fill the tank up all the way) but it was a lot less work and it doesn't look too obtrusive. assorted fish, hermit crabs, bugs etc. Mine is made out of cork bark. I found a piece large enough and cut it to the width of the tank so I could wedge it in place. wow! They are all so wonderful! RESnTX where did you find cork? I found mine at a local reptile store. You can find online stores that carry it too. I know you can get it from www.blackjungle.com. You can also try your local florist or home and garden store. Cork bark is used for some exotic plants. OH...did a search and found a site for orchids that sells it too www.orchid-supplies.com and it's a really great price too! I just found the coolest peice of cork bark at Petco for 12 bucks! My turts are so happy now. will post pix soon. 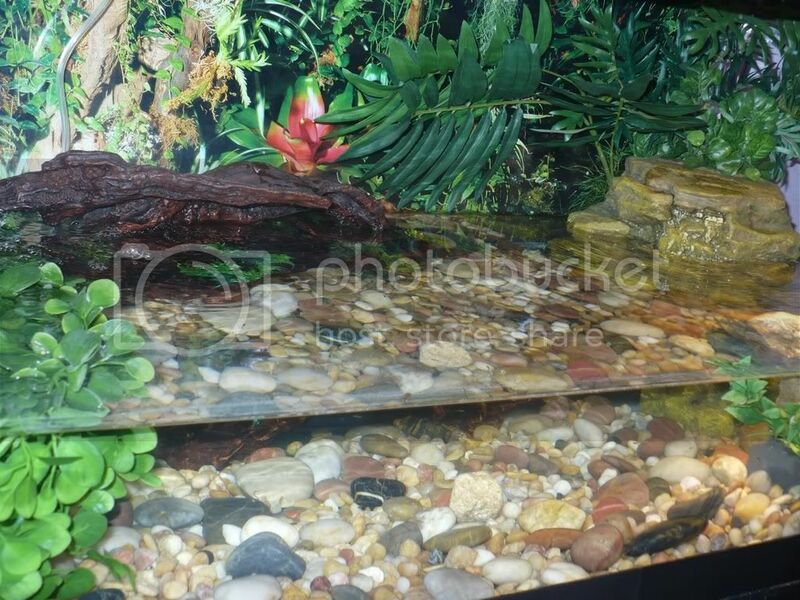 How do you clean or maintain it?Would take up alot of space? 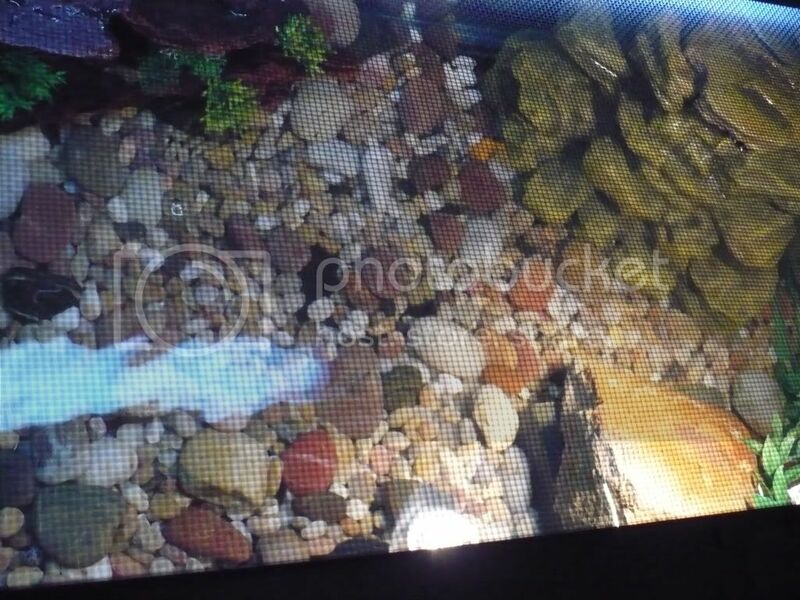 I am trying to find a new way for Shilo to bask, I have just given him a new 20 long and he really loves to swim and explore now! There isn't really any maintenance involved besides scrubbing it every once in a while. Before I put it in my tank for the first time I brushed it with a stiff bristled brush and soaked it for a couple of hours in the tub to clean it. I admit that it did turn the water brownish from leftover dirt I didn't get with the initial cleaning, so I just took it out and scrubbed it again. I haven't had to do anything else to it since then. It doesnt have to take up alot of room. You just have to find a piece that is the width of your tank or cut a piece to fit snuggly. It will stay in place on its own.